The MIDA Multi-Tool is a classic exotic from the original Destiny game that makes a comeback in Destiny 2. In this guide you'll find all the necessary quest steps to earn this exotic weapon for free, no luck involved. Why is MIDA worth getting? Well, it's two standout perks mean that whilst using MIDA you have increased movement speed and a constant radar that never disappears, even when aiming down sights. This is vital for most Raid encounters and even more so in the Crucible where players attempt to outflank you. 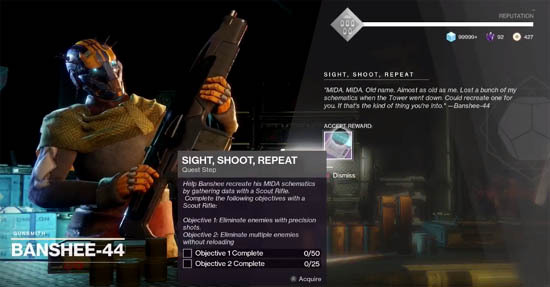 Furthermore, this quest will result in both the Multi-Tool and Mini-Tool, an SMG that works in harmony with the exotic for even greater bonus perks. Before venturing off to start the MIDA exotic quest you must have completed ALL the story missions and have reached Level 20. Other exotic quests follow a similar pattern and the MIDA quest is no exception to the rule either. "Initial Consultation. Devrim has a strange tale to tell of the Fallen. Get in touch with him and learn more"
Players should note that the recommended Power Level for this quest is 260. 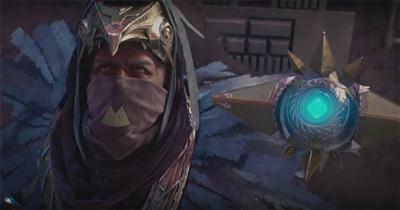 Accept the quest and complete all objectives, eventually resulting in a trip back to meet Devrim Kay. As a reward for your troubles, he gives you the Legendary Submachine Gun called MIDA Mini-Tool. 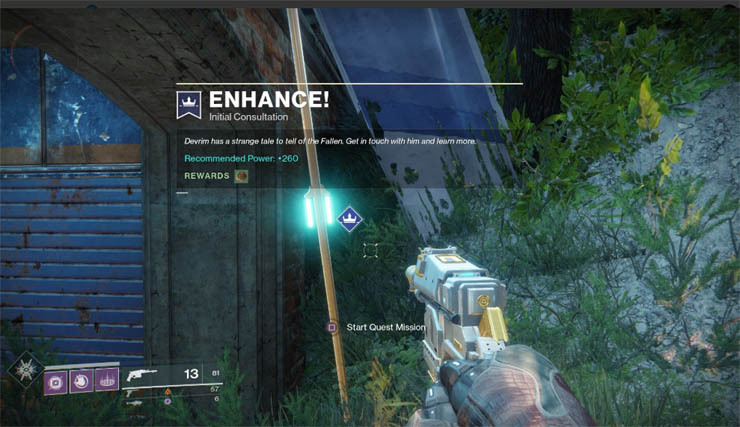 As part of this quest, you also receive a collectible item that only Banshee (the gunsmith) understands. MIDA, MIDA. Old name. Almost as old as me. Lost a bunch of my schematics when the Tower went down. Could recreate one for you. If that's the kind of thing you're in to". Note, you must kill three enemies without reloading for objective two. These can either be Rare or Legendary scout rifles so hopefully you haven't dismantled them all previously trying to get Gunsmith Materials for faction packages! If in doubt, get some materials together and buy Scout Rifles from one of the faction vendors or the gunsmith himself. "The MIDA series features several unconventional features. Banshee wants you to get kills with a Submachine Gun while airborne." This is the perfect excuse to use the MIDA Mini-Tool and test it out. That's it, job done! The MIDA Multi-Tool exotic is now waiting for you from Banshee. Just head back to the Tower and claim the weapon. The Power Level of the weapon will closely follow your existing PL, with a 5-10% increase commonplace. 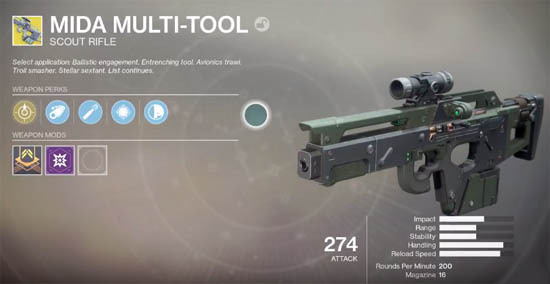 The MIDA is an exotic Scout Rifle that slots into the Kinetic class of weapon. It works well in tandem with the MIDA Mini-Tool which also boosts movement speed, making you even faster. 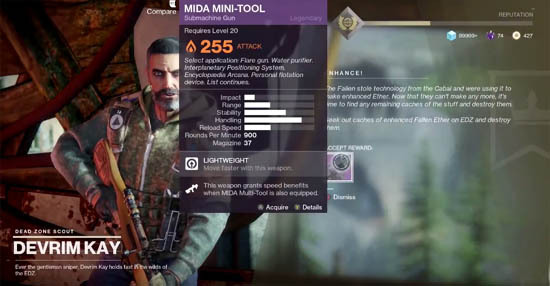 MIDA Multi-Tool - this weapon boosts movement speed. Corkscrew Rifling - Balanced barrel: slightly increase range and stability. Slightly increases handling speed. High Calibre Rounds - shots from this weapon knock the target back further. Slightly increases range. MIDA Radar - radar stays active whilst aiming down sights. Hand-Laid stock - This weapon is optimized for recoil control. Increases stability.